A new analysis from the Kaiser Family Foundation finds that the majority of states would have gotten less in federal Medicaid funding from 2001 to 2011 if Medicaid financing had been based on a per capita cap. The analysis looked at what would have happened if spending growth per Medicaid enrollee had been limited to growth in the medical care component of the Consumer Price Index (CPI-M) during that period. This spending growth limit is not quite the same as some of the limits proposed in the latest public version of the House GOP’s American Health Care Act (AHCA) bill, which would repeal the Affordable Care Act (ACA) and fundamentally change the structure and federal funding of Medicaid. The AHCA would tie growth in federal funding per Medicaid enrollee to the medical CPI (CPI-M) plus one percentage point for the elderly and disabled groups, and limit growth to the CPI-M for children, ACA Medicaid expansion adults and other adults. It also would allow states to elect a block grant for children and non-disabled adults. This analysis does not examine the specific policy revisions being proposed in the AHCA. 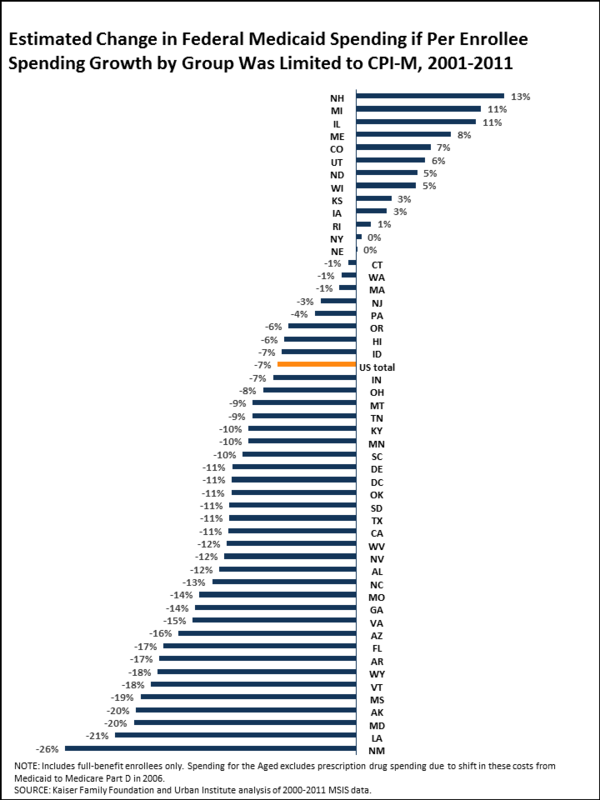 Over the 2001-2011 period, most states (38) would have experienced a reduction in federal Medicaid funds overall, including more than half (26) that would have seen a drop of 10 percent or more. (See figure below.) About half of states (25) would have seen a decline for each enrollee group (the aged, people with disabilities, children and other adults). The state impact differs by eligibility group. For example, for children, Arizona would have faced a 38 percent drop in federal Medicaid funds but Colorado would have seen a 24 percent gain. For adults, Pennsylvania would have seen a 45 percent drop in federal Medicaid spending compared to a gain of 10 percent in Iowa. For people with disabilities, New Mexico would have lost 22 percent of federal Medicaid funds compared to a gain of 20 percent in Rhode Island. And among the aged, Alaska would have seen a 31 percent decline in federal Medicaid spending compared to a similar size gain in Michigan. The timeframe for the new analysis is prior to the implementation of the ACA in 2014 and does not capture the differential impact that the AHCA would have in terms of policy or effects on states that adopted the Medicaid expansion. It therefore understates the potential impact of AHCA reductions on the 32 expansion states. A separate analysis, conducted with the Rockefeller Institute of Government, examines three scenarios that modeled how reductions in federal Medicaid spending would have affected state budgets had they been in effect in fiscal year 2015, and had state officials tried to completely fill the gap with state funding through taxes or cuts in education.